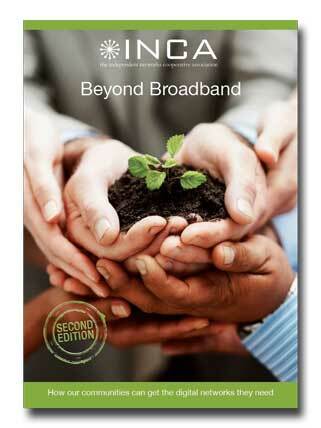 Beyond Broadband: How Our Communities Can Get The Digital Networks They Need is the guide from INCA designed to provide practical guidance to communities seeking to meet their own needs with respect to next generation digital networks. Yet many people live in parts of the UK where broadband still isn’t available or cannot deliver the performance they need to become fully engaged online. And already many countries are moving on to the next level – broadband over optical fibre – to enable video-rich applications and entertainment, to facilitate small businesses and home working, and to support multiple users in each household. The UK has been slow to deploy next-generation access and fibre-to-the-home. As a country we do not feature in the FTTH Rankings – a league table of nations where at least 1% of households subscribe to broadband over fibre connections. Indeed, analysts estimate that the UK lags the leading fibre nations like Japan and Sweden by at least five years. The cost of delivering next-generation access is high and reaching 100% coverage is currently beyond the scope of the major private sector players. This means that without co-ordinated regional and local action, many areas will be left without high-speed broadband for many years to come. This booklet is an important part of the process of sharing knowledge and information. It was conceived as a companion document to the FTTH Business Guide, a publication from the FTTH Council Europe that offers practical advice on the business case for fibre-to-the-home. We believe it provides a good template for next-generation broadband project development. The FTTH Business Guide analyses many of the high-level issues in fibre deployment, such as the major influences on income and expenditure, and their effect on the business plan. This booklet homes in on UK-specific issues, including public policy, industry stances, sources of guidance and information, and different project approaches – in other words, what works where.